Nigeria Football Federation president Aminu Maigari is backing Stephen Keshi to continue as coach and insists he is still the right man to lead the national team. Keshi has had a stormy relationship with his employers since leading an inexperienced side to victory at the 2013 Africa Cup of Nations in South Africa. Reports in the local media suggest the NFF are "extremely upset" over the coach's recent attitude and a foreign assistant could be imposed on him. But Maigari believes Keshi deserves some credit for Nigeria's recent revival and should single-handedly continue in the role. "It is a shame that some people only enjoy creating negative sensations in the media," Maigari told BBC Sport. "The NFF's decision to appoint Stephen Keshi has been positive for the country's football and it is evident in results. "There is absolutely no problem between the federation and the coach as we prepare for a big tournament as important as the World Cup. "We should also remind people that the decision to make Keshi the highest paid coach in the history of Nigeria was taken because we believe in him." Interestingly, Keshi was issued with an administrative query last month for choosing to attend a sponsor's event rather than a scheduled meeting with the NFF's technical committee. He was also asked to explain why he went on leave without permission, missing a reception hosted by President Jonathan Goodluck in February. 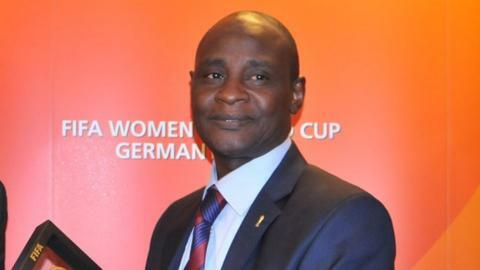 The letter, signed by NFF's Emmanuel Ikpeme, gave the former Nigeria captain 24 hours to respond to the questions raised. However, the incident had been dealt with in-house and Maigari blamed the media for inflaming the situation. "If anyone is in doubt they should ask questions but they will never do that, they go on Facebook, Twitter and use all other manner of media to damage the reputation of the leadership of Nigerian football without asking questions. "Seriously, the press should just be professional and deal with the facts rather than make up stories. "I want to appeal to them to allow us to concentrate on preparations for the World Cup rather than causing all manner of distractions." Keshi himself insists he is determined to focus solely on the World Cup despite his contract running out at the end of the tournament in Brazil. "Contract extension and all that, it's something I cannot talk about now," he said. "Right now I have to prepare my team for the World Cup in Brazil. I thank the NFF and my president [Maigari] for arranging these important friendlies for us. "I have said it over and over that, if it was all about money I would have gone to Equatorial Guinea who offered more money, but I love this job and my country. "If I thought I couldn't go on at any point I wouldn't waste my time I wouldn't waste my country's time more importantly. "If the conditions are right then I'll stay. I have a family to feed so that's important, after the World Cup we shall see." African champions Nigeria will face Argentina, Bosnia-Hercegovina and Iran in Group F at the World Cup in Brazil.